Also see the Help page for more information about how the audio works, and the Groupworld test wizard which lets you test your system for compatibility with Groupworld (including audio/video). If you cannot solve the audio/video problem, try rebooting your computer and/or use a different web browser. You can also contact us and we will be happy to help you troubleshoot if the steps below do not resolve the issue. If you experience echos, make sure both users are using headphones or a headset. (Bear in mind that iphone earphones are not fully compatible with Macs, so you may still experience echos). Alternatively you can use the Firefox browser, which includes built-in echo cancellation. Also, if there are only 2 users in the room, you can enable WebRTC for the room (in the control panel), which automatically removes echos. (WebRTC is now enabled automatically in all new rooms). Make sure you plug in your headset before logging into Groupworld. (If you plug in your headset in after connecting to Groupworld and it isn't working, try reloading the Groupworld conference room web page). Try reloading the Groupworld web page, or using a different browser if you have problems. Chrome and Firefox work best. When you speak, you should see a horizontal red bar move underneath your video window. You will also see a red circle light up under your video. If you don't see these, it means that Groupworld is not picking up your microphone. When the other user speaks, you should see a green triangle light up under their video window. If you see the green triangle light up but don't hear anything, it means that your headphones aren't working. Try reloading the page and check your headphones are set up correctly. (Check to see if you can listen to a youtube video through them). Simply click "Allow" to give permission to use your microphone. You only need to do this once, and Chrome will remember in future. This will allow you to select a different microphone (if your computer has more than one). If the video camera icon has a red X through it, clicking it will allow you to give permission to Groupworld in future (you will need to reload the page afterwards). 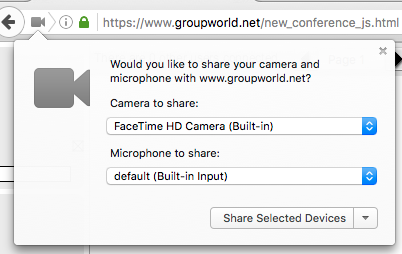 Simply click "Share selected devices" to give Groupworld permission to use your microphone and/or camera. You can choose "Always share" from the drop-down menu (to the right of the "Share selected devices" button) if you always want to give permission. This will allow you to select a different microphone (if your computer has more than one), or give permission if you previously didn't give permission. Simply click on "Allow" to give Groupworld permission to use your microphone and/or camera. If you don't see this popup, go to "Safari->Settings for this website" and check the Camera and Microphone permissions.